University of Illinois Press. Used - Very Good. Ships from the UK. Former Library book. Great condition for a used book! Minimal wear. 100% Money Back Guarantee. Your purchase also supports literacy charities. University of Illinois Press. Used - Good. Ships from the UK. Former Library book. Shows some signs of wear, and may have some markings on the inside. 100% Money Back Guarantee. Your purchase also supports literacy charities. 2004-05-05. New. Ships with Tracking Number! INTERNATIONAL WORLDWIDE Shipping available. Buy with confidence, excellent customer service! 1993-04-03. Good. Ships with Tracking Number! INTERNATIONAL WORLDWIDE Shipping available. May not contain Access Codes or Supplements. May be ex-library. Shipping & Handling by region. Buy with confidence, excellent customer service! University of Illinois Press, 1993-08-01. Hardcover. Used:Good. University of Illinois Press. PAPERBACK. 0252071700 New Condition. . New. University of Illinois Press. Hardcover. 0252020065 New Condition. . New. 2004-01-22. Good. Ships with Tracking Number! INTERNATIONAL WORLDWIDE Shipping available. May not contain Access Codes or Supplements. May be ex-library. Shipping & Handling by region. Buy with confidence, excellent customer service! Baltimore, Maryland, U.S.A.: Univ of Illinois Press, 1993. (1st) Fine brown cloth, silver lettering very bright on spine, 281 pages, a brief biographical note and a list of books in Sport & Society series. DJ glossy light yellow background beneath mylar with b/w photo of Hooper on front, another on back with statistics. DJ has light crease down spine top. Near Very Fine DJ/Very Fine book.. First Edition. Cloth. Fine/Near Very Fine. University of Illinois Press. Hardcover. 0252020065 Like New Condition. . Fine. University of Illinois Press. PAPERBACK. 0252071700 Like New Condition. . Fine. University of Illinois Press, 1993-08-01. Hardcover. Good. University of Illinois Press, 2004-01-22. Paperback. Used:Good. Urbana: University of Illinois Press. Fine copy in fine dust jacket. 1993. 1st. hardcover. 8vo, 281 pp. .
Chicago, Illinois, U.S.A.: Univ of Illinois Pr, 1993 hardback book and dust jacket in fine condition. 1st Edition. Hardcover. Fine/Fine. University of Illinois Press, 2004-01-22. Paperback. Good. University of Illinois Press, 2004-01-22. Paperback. Very Good. Very good paperback. Spine is uncreased, binding tight and sturdy; text also very good. NOT an ex-library copy, NO remainder mark, NOT a book club. Ships from Dinkytown in Minneapolis, Minnesota. University of Illinois Press, 2004. Paperback. Very Good. Disclaimer:A copy that has been read, but remains in excellent condition. Pages are intact and are not marred by notes or highlighting, but may contain a neat previous owner name. The spine remains undamaged. At ThriftBooks, our motto is: Read More, Spend Less.Dust jacket quality is not guaranteed. 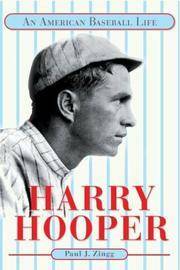 Harry Hooper: An American Baseball Life. Illinois. New. Fine. Paperback. 2004. Originally published at $20.00. Illinois. Used - Like New. Fine. Paperback. 2004. Originally published at $20.00. Illinois. Used - Very Good. 2004. 0th Edition. Paperback. Very Good.